For the vast majority of the world, there will be a second full moon in the month of January. The one sector that won't experience two full moons in January (2018) will be in the eastern hemisphere in the 11th to 12th time zone where this full moon will be in the earliest hours of February 1. The rest of the world will not experience any full moon in the month of February, this year. Regardless of the date of the full moon, it will be a super full moon (closer to the Earth) making it appear larger on the horizon, and it will also be a total lunar eclipse, causing it to appear reddish. 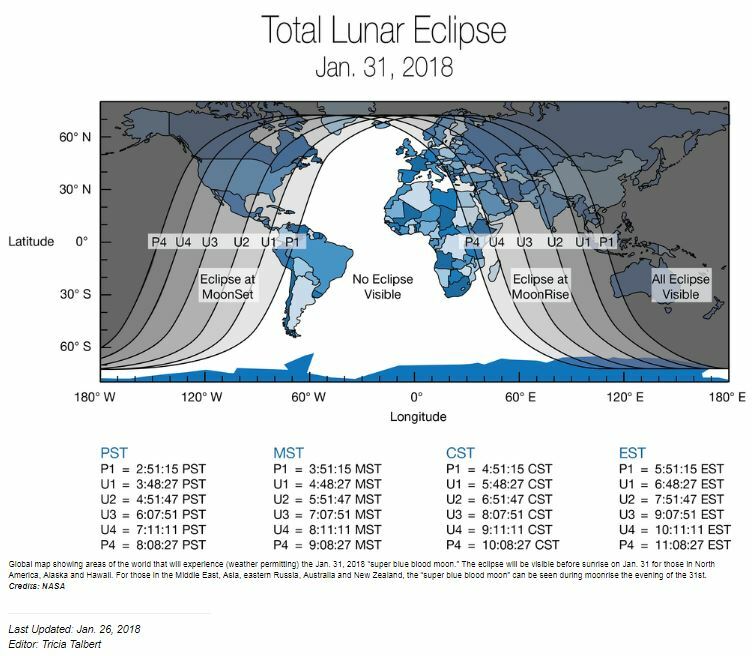 The portions of the world that will be able to watch the whole lunar eclipse will be most of Eastern Asia, most of Australia, New Zealand, the islands in the Pacific Ocean, Alaska, and northwestern Canada. Unlike a solar eclipse, there is no need for special glasses to watch a total lunar eclipse. A map has been included at the bottom of this page. The whole mythology of the Blue Moon became distorted almost a half century ago, when the seasonal blue moon was confused with the idea of two full moons in one month. There is no inherent astrological significance of two full moons occurring in the same month mostly because the time zones can make or break the blue moon from occurring in any given month. However, having two full moons in the same zodiac sign is not impacted by the time zones and has more significance based on the full moon occurring at 0 degrees and/or 29 degrees within a sign. This lunar eclipse belongs to the lunar saros series 124. The series originated in August 24, 1152 in the Northern Hemisphere. This series is associated with the first nodal eclipse family (1N) and also associated with the eclipses of last August. The February 15, partial solar eclipse will finish up the first of the nodal family eclipses. The second family series will begin in July. Since this lunar eclipse is total, it adds weight to the chart's aspects, hitting us heavier than a typical full moon, as we attempt to understand the importance of the messages being conveyed. The Sun in Aquarius is opposed by the Moon in Leo, in the second decan. We may feel torn between loyalty and cutting ties to develop new relationships. The Sun is forming a loose conjunction to Venus in Aquarius, adding an urge to tap into any relationship or financial resources that are apparent to us. At an emotional level, this conflicts with our "tried and true" methods that have worked for us in the past. We want to take the risks, but at the same time, see the value in the processes we have used in the past. In the end, it boils down to what we are willing to risk losing in order to explore these other options. Mercury is on the anaretic degree of Capricorn and right on the cusp of moving into Aquarius. This can cause us to question the intellectual and organizing methods we have used up to this point, as Mercury prepares to move into the next sign. Mercury is moving into a sextile to Mars in Sagittarius. At the moment, the sextile is "out of sign" and carries less weight. Tomorrow, the aspect will be stronger. We are likely to feel more invigorated, attentive and possibly more assertive, once Mercury is in the sign of Aquarius while sextile to Mars in Sagittarius. Venus in Aquarius is moving into a square to Jupiter in Scorpio. Jupiter is moving over a critical degree of Scorpio, adding extra Oooomph to the aspects. This is one of those "dress for success" times, when first impressions are very important. We need to be a bit more cautious about what we say, as well as curb some of our facial expressions, if we want to make a good first impression. This is trickier for some, especially for those who wear their hearts and emotions on their sleeves for everyone to see. Time to dust off the acting skills and/or practice "facial restraint" in the mirror. For some of us, this could start us on a new career path, or an increase in our wages. For others, it could break us out of an old mold, freeing us to start on a new adventure where money is less important than the feeling of a new release. Jupiter is still forming a sextile to Pluto in Capricorn. We have a strong desire to change. We need to be careful to change for our own best interests while pushing aside negative attitudes that are no longer working for us. We may be noticing that the planets are still motioning direct (forward) with no major planets (yet) moving retrograde. It is especially rare for all the planets to remain in forward motion for more than a few weeks. However, this year, we will get two months (nine weeks) of this forward moving influence until Jupiter begins to retrograde motion in March. Make use of all these planets moving forward at the same time, to put our best foot forward. Overall, the planets in this chart are positioned with balanced receptive (feminine/masculine) placements, helping us to make better, and informed decisions. The elements placements are also balanced, as we find that our decision making and planning abilities are working in our favor. However, there are five planets in Fixed modalities, that could have us feeling somewhat stuck between actually moving forward and looking to the past for guidance. We may need to cut ties with outdated methods in order to get our needs met. If you are in the eastern hemisphere time zones of 10 to 12, or in the western hemisphere time zones of 10 to 12, and the night sky is clear, take the opportunity to watch this super-sized total lunar eclipse. The eastern hemisphere time zones of 7 to 10, may also be able to watch the lunar eclipse at sunset (moon rise) while the western hemisphere (America) time zones of 7 to 10 may be able to view the lunar eclipse early in the morning before sun rise (moon set). In two weeks, the solar eclipse of this eclipse-set will occur on February 15, which is also the Chinese New Year. Take advantage of our sale on reports for the next two weeks. The beauty in a song resides not only in the melody, but in the meaning of the words as well.